I was very excited when the CRM team asked me to write a post for this blog since I had just finished putting together a solution for a client that integrated files and folders into a CRM tab. I thought it would be something that a lot of people would find useful – perfect for a large audience like this. A number of CRM developers have developed solutions that integrate SharePoint document stores into CRM. The solution detailed in this article is a twist on that concept that will enable you to integrate Windows Explorer instead of a SharePoint document store in order to view context-sensitive shared folders and files directly within CRM. While this solution also incorporates a SharePoint webpart to do some of the heavy-lifting, it gives the end user all of the familiar characteristics of Windows Explorer. This includes the ability to drag and drop files, rename items, copy, paste, and delete files or folders, and all of the other wonderful functionality of the context menu available by right-clicking in Windows Explorer. An .aspx page that invokes the SharePoint Page Viewer webpart and receives the parameters passed from your Account form. An iframe on your Account form to hold your .aspx page. Test your webpart to make sure it shows your shared folders. At this point it won’t point to a specific client’s folder, just the top folder that contains the client’s folders. You should test that this webpart works for your users as well, making sure the path to the share is accessible to all of the CRM users who will be using it. Be careful removing anything before the opening <body> tag! You can test your progress along the way by opening Internet Explorer and browsing to http://crmserver/custom/fileviewer/ (replacing ‘crmserver’ with your CRM server’s address). 2. Once you have a nice clean custom page that displays only the Page Viewer webpart, you can go to the CRM account form to add a new tab with an iframe. There’s plenty of documentation about how to do that in CRM’s great Help files and on the web, so I won’t go into that here. Name the iframe ‘fileviewer’ and set its source to /custom/fileviewer/default.aspx. Remove the checkmark from “Restrict cross-frame scripting” and format the iframe to expand to all available space. Preview the form. You should see your shared folder in your iframe. 3. Now, here comes the juice! Our custom SharePoint page in the new iframe on the account form isn’t very helpful at this point because if you publish your form now your users will still have to navigate down to the folder specific to the account they are working on. Maybe it saves them a few clicks, but it’s not gonna knock their socks off. So we want to somehow tell the custom SharePoint page what account we’re looking at and have it navigate down to that folder for us. Fortunately, CRM let’s us add Jscript to the account’s OnLoad event that will help us do this! So now the source of the Page Viewer webpart’s iframe is set to //servername/share name/client folders/Adventure Works Cycle. 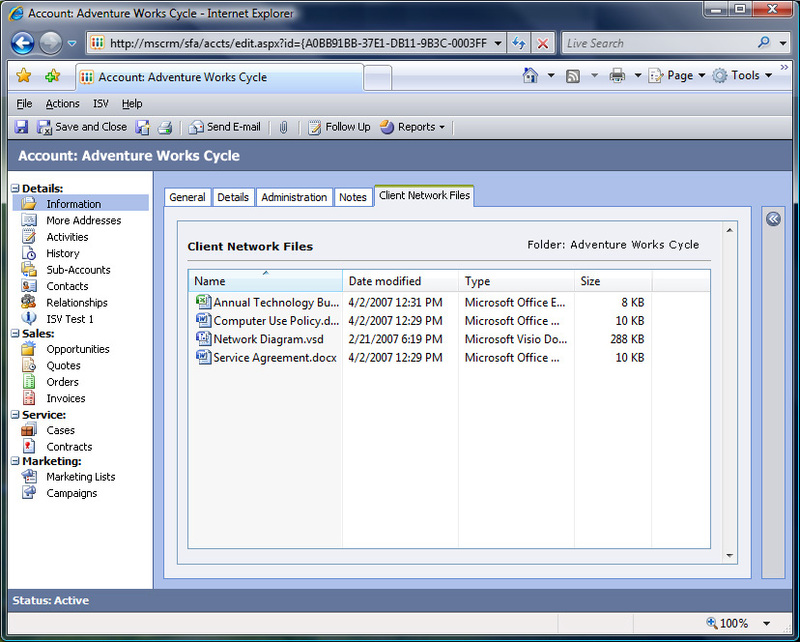 And voila, the user who is looking at the Adventure Works Cycle account in CRM also has immediate access to the account’s folders and files on the server! The user can drag and drop, copy, paste, delete, and do whatever else their Active Directory permissions permit with these files, so make sure you have proper permissions set on the ACLs for your shared folders. The view of the folder shown in CRM will match the user’s preferences as set in Windows Explorer, so if they have set every folder view to display in thumbnails or tiles, that is what they will see here. Internet Explorer will give occasional security warnings when you execute a context menu command in the Windows Explorer webpart, but they are relatively unobtrusive and the efficiency gained is worth it! Lastly, as someone who comes to CRM with a web design background, let me suggest that while you’re customizing your SharePoint page, you might consider referencing CRM’s style sheets to add some background colors, borders and headings to make the webpart look like it belongs in CRM – your users will appreciate your thoughtfulness.